It’s almost race & show season and I have been signing up to attend events all over the country. One event that will be a first time for UPR is the LIGHTS OUT IV race at South Georgia Motorsports Park, February 21-24. UPR started as a stock suspension company and what better event to support than one of the biggest stock suspension races anywhere!? Also, here’s a first…I was told that promoter Donald “Duck” Long feeds everybody at the track on Friday and Saturday night. This event should be a great way to kick off the 2013 season! I am also finalizing several other events and here is where it gets more difficult. UPR started as a stock suspension company. We set out to offer the best products at the lowest prices. But we are also 100% car enthusiasts and this led to the rise of our industry leading line of billet dress-up parts. So now I am scheduling for car shows, Ford races, all brand races, and even swap meets (Carlisle All Ford) and Mustang Week. This requires different layouts and selling strategies, but it’s a win-win situation because I get to meet all our customers on their home turf. However, there are many scheduling conflicts this year for which we are coming up with a “Plan B”. My biggest event of the year is the NMRA Bowling Green event and I’ve attended every one so far. But on the same weekend is Shakedown at the Summit, arguably the best race for racecar diversity, and without a doubt Norwalk is the best drag racing facility there is. So I gotta be true to my roots and go to Kentucky, but we will be sending our sales manager Jeremy to Norwalk to represent UPR. Also Memorial Day weekend is another conflict. I will be attending the Mustangs at the Mickyard MCA event as I believe it’s going to be BIG! But the Yellow Bullet Nationals will be at Cecil County Maryland the same weekend, so Jeremy will be going there. Anyway, I hope everyone who can will attend the LIGHTS OUT IV event in Valdosta, Ga in two weeks. Stop by the UPR trailer and see our new steel billet Anti-roll bar for 2005-13 Mustangs as well as our GM G-body suspension and all our UPR Pro-Street and Pro-Series Ford suspension parts. Also, if you’re planning to attend this event and you need any UPR parts, you can call in your order now and take advantage of FREE DELIVERY to the track. Lastly, Joe reached out to an old friend lately, a person we here at UPR have always respected as being the best in his field. I hope he has it in his heart to give us another chance. Recently, Jeremy Martorella wrote a custom SCT tune for a 2012 V6 Mustang customer. Not only was the customer impressed with the performance and response increase but he was also grateful for the mileage increase. He got 36mpg highway on his last cruise. UPR tuning is about gaining performance without diminishing drivability or longevity. Jeremy really liked the overall V6 platform and he has performance and handling packages for V6 Mustangs in stock. I realize there are countless tuners out there and all kinds of miracle claims but after all the years I have spent as an enthusiast and a racer, I have come to the conclusion that the most important attribute of any tuner is real world (not keyboard) experience. I was lucky enough to be involved with pioneers in the electronic tuning industry. Mike Wesley of Autologic (and now Diablosport) and Chris Johnson of SCT and JMS. Both had Mustangs and both raced them. I feel this gave them a real edge over the computer competent tuners that lacked real world experience. Sort of like priests teaching marriage preparation classes or like Rodney Dangerfields ‘”Back to School” economics class- “What’s a widget?”. And of course UPR has been associated with premier race car tuners like Steve Petty who tunes Jeg’s world champion Pro Mod and Tim Lynch’s 10.5 Outlaw cars, so we’ve learned a tremendous amount in the last 20 years. Right here at UPR, we were dynoing a GT500 for another well known local shop. Jeremy was running the dyno and in the drivers seat. After a few pulls he realized that the RPM limiter was set too low. He based it on not only how the car felt but also from looking at a power curve that was still climbing. When he suggested it be raised the long distance tuner dismissed him saying “you don’t need to go any higher”. When Jeremy insisted at the track that it be raised (since he was doing the driving, not to mention 20 plus years of dragstrip experience) the car responded with a major performance increase. It went from a previous best of 10.10 at 139mph to 9.66 at 146mph with no other changes. So I believe that UPR custom tunes offers the consumer the best combination of performance, drivability, and economy. They are developed on real vehicles during real testing, not theory. They also include lifetime updates and direct tech line to Jeremy for help at the racetrack. Take advantage of all the hard earned knowledge and experience that UPR offers and freely shares with our customers and fellow enthusiasts. Call UPR first for tuning your ride. We’re going to work hard at getting our UPR project cars running in the next few months. When we get back to work on Wednesday we will be installing an AMS 1000 boost controller in our 2013 5.0 Hellion Mustang. Our goal is to break the 9.50 barrier without pushing the car much harder (9.73 present best). Over the years we have learned some tuning tricks from the best in the business- Steve Petty, Turbo People, and Brad Brand. Jeremy wants to further tweak our UPR Pro Series rear suspension and see if we can use the boost controller to help us further lower our great (for a turbo street car) 1.40 sixty foot time in our quest to pick up a quarter second of ET. We are presently at 14 lbs. of boost and feel we don’t need more than 16 lbs. to reach our goal. Some local supercharged 5.0′s are running well into the 20lb boost range but we at UPR try to maximize the efficiency of our combination rather than just go for all out horsepower and the resulting stress and breakage it leads to. After all, this is a daily driver and is a true “sleeper”. We won’t compromise the smooth idle and response nor the 20 plus mpg fuel economy. And we are also in no hurry to grenade the stock transmission that has been working so well. Most importantly, I want to thank all our customers and dealers for their support. We at UPR truly realize we would not be here without customer loyalty. We take nothing for granted and try every day to improve our products and customer service, as anything less than 100% customer satisfaction is unsatisfactory. I have made many friends over the years and look forward to every opportunity to meet a fellow enthusiast. For 2013, we are developing a series of anti roll bars for street and strip for the S197 platform. We are also developing more products for the G body GM products and the new Camaro. I own a 2006 Chrysler 300 SRT 8 which is a great 4 door sporty vehicle, so we will also continue to develop Mopar parts. At the top of the UPR to do list is the formation of new Pro Street Series Handling and Traction packages for the S197 Mustangs. They will be offered in stages and consist of control arm, spring, shock and strut combinations which offer great results at affordable prices. We will be testing these at Sebring and Palm Beach on Sharad’s GT. UPR will also offer an extended line of Pro Series suspension packages for late model Mustangs looking to lower their 60 foot times and maximize their ET’s at the track. I just finished the fuel system on our Project Terminator 2003 twin turbo Cobra so that should be out and running soon. We also picked up an AMS 500 boost controller for our 9.73 ET, 2011 Hellion single turbo Mustang and are looking to break the 9.50 barrier. We are waiting for our 3 speed race automatic for our 2009 Shelby which we expect to run mid 8′s with a 4.0L whipple blower. Last but not least we are prepping to install and test the Edelbrock G force supercharger system on our 2013 Coyote and offer several UPR performance packages based on that kit. Recently a comment was left on our Facebook calling me a “LEADER in industry”, coincidentally after my blog on “haters”. Well I want to assure anyone who doesn’t know me that I work 7 days a week and don’t own a tie. During race season I drive and sleep in an 18 wheeler, spending 14 hours a day on my feet when at the event. And when I say I’m lucky to have so many friends and customers it is because I TRULY appreciate them all. I know my place and thank God for what He has given me. We at UPR believe great customer service is our number one priority. It is the reason we attend so many events with our staff and sales trailer. It gives us an opportunity to meet our customers face to face and display our products first hand. It is also a great opportunity to fix any problems that a customer may have encountered. Our salesman are taught to not hang up the phone until the customer is fully satisfied. If a salesman senses that may not be the case, his orders are to put the sales manager (Jeremy Martorella) on the line who has a near 1000% batting average at finding solutions. In that same spirit we have our internet specialist Sharad reading the forums every day and offering help to enthusiasts whenever he can. We have been building fox body and newer Mustangs at UPR since the late 1980′s. We have pretty much seen it all and have been instrumental in the growth of the tremendous Mustang movement. We sponsor or support many forums and car clubs. But we are well aware that lurking in the shadows of some of these forums are some really unhappy people aka “haters”. And many times over the years we have tried our best to honestly answer complaints only to be thrashed by keyboard jockeys that have a fraction of the experience and none of the accomplishments that we at UPR have worked so hard to gain over the years. In fact, although we were one of the original sponsors of the Corral, we have since politely pulled our support. Well, I realize that to abandon a large group of enthusiast because of a few “haters” is hypocritical to our policy. So this week I instructed Jeremy to start in the suspension section of the Corral and offer assistance where he could. I believe Jeremy to be one of an elite group of drag suspension specialists with his roots in the Mustang movement. He has been tuning our customers and our own race cars for two decades, all the while adding to his knowledge exponentially by comparing notes with our many UPR racers like Chris Little or Tim Lynch. I have watched him bring an undrivable Toyota Solara into the 6 second range with only a few passes of adjustments. More importantly, he has taken our daily driver 5.0 turbo Mustang from 1.7 60-foot times to its present 1.40 60-foot at 9.73 ET. After a few posts he came back to me and told me that the haters and know-it-alls are still there but he will simply ignore them and continue to do his best with his answers. Probably most important is that he realizes there are different ways to achieve the same results, so no one answer is absolute. But rest assured his answers are based on many years of first hand experience as a driver and tuner (and being taught by Billy Glidden is an invaluable asset). Most importantly, they will and have worked. No brag, just fact. Spent time this week developing a new part. UPR welcomes suggestions for new products and gets lots of great ideas from our customers at the many races and shows we attend. Many times this year we have been asked for remote breather tanks and coolant overflow tanks. Although the market is flooded with overseas inexpensive products, UPR feels there is good demand for a reasonably priced high-quality Made in USA billet part. We designed the breather can to accommodate push-in, screw-in and over the top style breathers. We also designed it to have a -12AN screw in fitting which will make it capable of accommodating lines from -8AN to -16AN. Rather than just have an empty can like all the imports, we designed a baffle system to trap any liquid that finds its way into the can. And of course there is a petcock on the bottom for easy draining. We also designed it to use the many mounting brackets we now offer for our best selling catch cans. We have a prototype on our 2011 5.0 Turbo Mustang. It looks and works great on any vehicle from a daily driver to a 7-second race car. Next up is a quart size billet radiator overflow can. In the next few days we will have photographs on our website and facebook, as well as upcoming press releases in major publications and probably an email blast to our dealers and retail customers. Jeremy and I spent Friday at the PRI Show in Orlando. We are both sorry we couldn’t stay for the NMRA racers banquet, but our most sincere thanks and appreciation goes out to all our racers and friends in the NMRA. Attendance at the show seemed down but we spent the entire day walking and talking to past, present, and future suppliers and customers. One new product we are excited about is our new Made in America line of aluminum double-adjustable coil-over shocks. We are also introducing a new line of billet aluminum breather & overflow cans with internal baffling and incredible looks- all made by UPR in our south Florida manufacturing centers. The flood of offshore “tin cans” will now have to compete with high quality US made billet pieces. We are also finalizing hose & fitting upgrade kits for our best selling oil catch cans- look for announcements online and in magazines. Jeremy and I spent today, Saturday, putting the finishing touches on our latest race vehicle. 8 year old Sam Martorella is now UPR’s first entrant into the Junior Dragster ranks. Hopefully Sharad has posted some pictures on our Facebook page. It runs on alcohol which requires draining the oil after each session (I know, big deal, 1 quart!). We had to troubleshoot the brake system because the pedal was spongy, and Jeremy was probably more serious about getting it perfect than in his own 200mph racecar. Since I built pro Stock 1260 Suzuki motorcycles 30 years ago, and because I repair lawnmowers, the powertrain was pretty easy. They were headed for an evening test session at PBIR tonight. In a closed test session inside our garage, Sam seemed to be as calm as his dad and uncle Joe behind the wheel – Here we go again! Today I was outvoted on the future of our 2009 GT500. I had planned on it being the ideal 9-second daily driver with a TVS blower and overdrive automatic. My son (it’s his car) decided that since we have our 9-second 5.0 Hellion Turbo Stang and our 2010 9-second 3-valve convertible, we should install his 1345 hp GT500 engine with 4.0 Whipple. I see his point, maybe I was just being lazy, or frugal. Anyway, it looks we’ll be ordering Strange brakes and axles (assuming we keep it an 8.8), an Aeromotive Cobra Jet fuel system, and whatever else it takes to make it fly. Probably the best news is that my good friend Jimmy LaRocca will be assisting us with the tuning, and that he and Jeremy already have some very good ideas how to make it hook and stay on the ground (torque=wheelies). We also have a new boost controller coming for our turbo 5.0 which we feel can help us improve on our already incredible 1.40 60 foot time on 275 Drag Radials. Our UPR Pro Street rear suspension is working great. I will continue to post our progress on building and racing both cars. Tomorrow is Cyber Monday and I hope our customers take advantage of the many special deals on UPR Products this week. 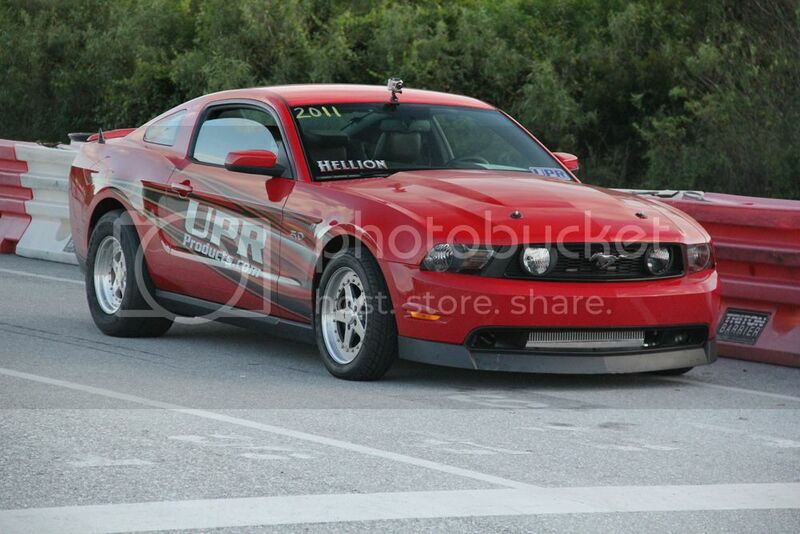 Last night we took the UPR Hellion turbo 5.0 Mustang to the track. We are trying to get the ET down without excessive boost and have been concentrating on improving 60-foot times. We pulled our best 60-foot time so far at 1.40 and it resulted in a 9.73 at 137.5 mph. We are only making 14 lbs of boost and will continue to turn it up in increments. The goal of our project is to keep the car 100% driver friendly. It idles at 800rpm and is extremely quiet and smooth. I did get a chance to see a fast Procharger 5.0 there, but underhood it was really busy with hoses and wires everywhere, as well as being very loud. It made me appreciate the simplicity of the Hellion kit. Jeremy took his twin turbo 93 Cobra out and made a few passes but an 8.12 @176 was marked with wheelspin most of the run, so we decided to wait for better track conditions. Happy Thanksgiving to all of our friends, customers, and racers. We truly appreciate and value our relationships and hope everyone has a great holiday. And don’t forget to check out our great deals on the UPR website and Ebay store. This past weekend, I blogged on facebook about our Sunday work detail here at UPR. The spark plugs with a tighter gap are now installed on our Turbo 2011 5.0. Also, we had many comments about Jeremy and his twin turbo 93 Cobra. Well, it’s up and running. He tuned it for low boost and longevity, but it still made serious power (I can only say over 1000 rwhp- not my car!). The game plan is to enjoy testing it locally for now. We are thinking of going to Palm Beach International Raceway Wednesday night for Test n Tune with both cars. If you’re in the area, stop and say hi. We are looking for a 9.70 or better from our 5.0 and, as I explained in an earlier blog, timeslips take a back seat to longevity and drivability. I spent a lot of time this weekend updating our magazine ads. We are on a mission at UPR to avoid “stale” advertising, and we will be constantly updating our ads to reflect new products and sales. I am also exploring Twitter (I really am a dinosaur when it comes to modern communication) to announce new products and events in the UPR family circle. Tomorrow I’ll talk about an interesting meeting we had with Dan Dolan from Diablosport.